Earlier today, we showed you renders of the Samsung Galaxy S9 and Samsung Galaxy S9+ standing side-by-side. The image came from none other than Evan Blass (@evleaks.com), whose face and name show up in the dictionary under leaks. This afternoon, some new images appeared on Evan's Twitter account, including one photo showing the rear components of Sammy's 2018 flagship phones. 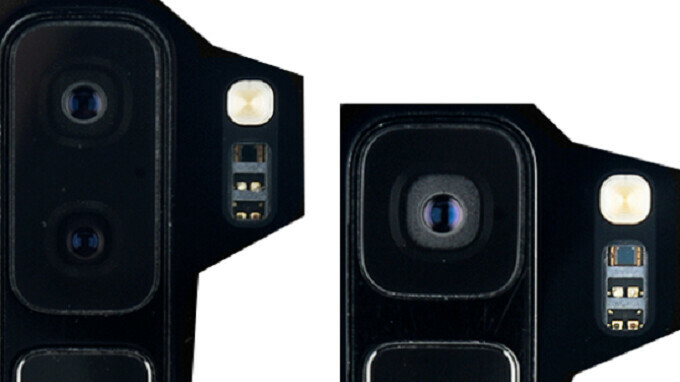 The component featuring two vertically mounted cameras belongs to the larger Samsung Galaxy S9+. Both shooters weigh in at 12MP. To the right is the rear layout of the Samsung Galaxy S9. That is a single 12MP camera that you see in the picture. Last year, Samsung was criticized for the placement of its fingerprint scanner on the Galaxy S8 and Galaxy S8+. The biometric button was placed on back, too close to the rear camera lens. Some users, blindly trying to find the fingerprint scanner with their finger, ended up smudging the lens. When the Samsung Galaxy Note 8 was released a few months later, the manufacturer put the flash module in between the fingerprint button and the lens, reducing the number of times that the rear cameras would get dirty from the user's finger. With this year's flagship models, Samsung has gone vertical. The fingerprint button is below the rear camera(s) which should make it easier to feel for. This should greatly reduce the possibility of getting smudges on the rear camera(s) while trying to unlock your phone. The Galaxy S9 and Galaxy S9+ will be unveiled on February 25th during the 2018 Samsung Unpacked event in Barcelona. The MWC trade show begins the next day. Shh... It's Samsung... Everything done by them is perfect and a first for the market, even if it is not. .. The placement is perrrrrfect.. Except that the quality took by Samsung's smartphone exceeds expectation. You're making fun of yourself you know. I doubt it, Samsung is probably waiting of on screen FPS, once that happens they'll switch to that. They only put it on the back because of the longer screen. This can’t possible be real? I was expecting a much sleeker looking S8... not a step behind. Really ugly and awkward looking imho. The first question you obviously should have asked is, how the heck did Chuck007 get a real hands-on a full month before it's launched? Just to clarify, I was referring to “leaked” press pics of the front of the S9 and S9+. Unlike how previous rumours claimed, the bezels look hardly smaller then the S8... not to mention how it gives me LG G6 vibes. As the others have said, who knows? Looks like the Note 9 (with its supposed on screen FPS) is the breakthrough Samsung phone this year. This phone seems boring. Placement of Touch ID at the back sounds so ... “exciting”. I guess performance wise would be as fast as iPhone 6s. You'll get use to it, personally I preferred the current S8 FPS position. Ususlly a case mitigates the problem of accidental touches as it either has separate cutouts, a clip that slides towards the FPS or a raised lip around the FPS. It's not that deep. At least we have options for unlocking. Well, this time the fingerprint scanner's placement is impressive! I hope it will be much easier to use the fingerprint sensor than before. Moreover, I wish the phone should be priced around $750-$800 so that I can afford it. If you guys want to know more about Galaxy S9, then please have a look at my blog (Slashinfo.com). Till then, Let's be connected to PhoneArena for the earliest news on Galaxy S9. A welcome improvement. Wonder why they couldn’t center on previous models? personally, it doesn't matter to me. I've had the S8plus since launch, and got used to the "weird" placement fairly quickly. with a case, muscle memory kicks in fairly quickly, I don't think I've touched the camera lens in months. that being said, seems they would have moved the S9 button further away from the camera lens, but I'm sure Samsung will still sell boat loads of both versions of the phone.